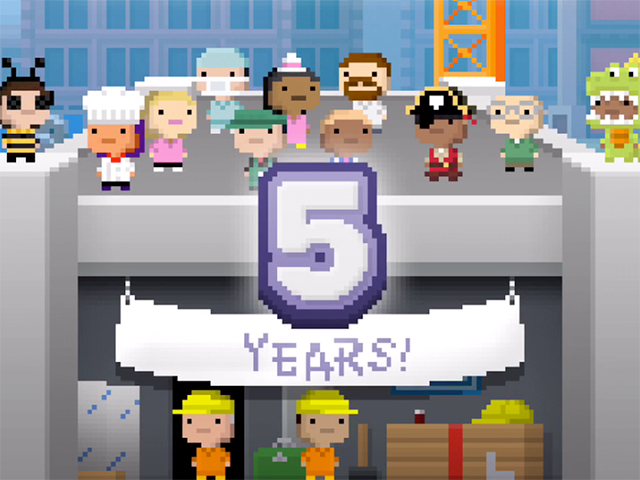 To celebrate the fifth birthday of Tiny Tower, developer NimbleBit released a major new content update in the game. To celebrate the fifth birthday of Tiny Tower, developer NimbleBit released a major new content update in the game, introducing new floors, missions and more to players. In Tiny Tower, users construct towers one floor at a time, and they can recruit Bitizens to live and work in their buildings. This update includes new floors, costumes, lobbies, roofs, elevators and BitBook posts. In addition, users now have access to QuickStock features, which allow them to instantly order and deliver stock to all of their floors. Users may need to spend a combination of coins and Bux, the game’s premium currency, to activate these QuickStock features. Elsewhere, users can now rename their Bitizens, and they can also trade Bitizens with their friends. Finally, users can earn a new currency called Golden Tickets by resetting their towers and starting over from the beginning. Specifically, one Golden Ticket is rewarded for every 50 floors in the current tower. Golden Tickets can be used to upgrade business floors to have free and instant stocking, or to maximize the skills of every Bitizen living in a residential floor. When users reset their towers, they keep their Bux, cosmetic unlocks and any existing Golden Tickets. Tiny Tower is available to download for free on the iTunes App Store and Google Play.